What that graph shows is that the 1-month to 6-month Treasury rates, aka short-term rates, are HIGHER than the rates from 1 year to 7 years maturity. I graphed what the yield curve looked like at the beginning of the month, so you can see what happened: the short-term rates, which the FOMC can most directly influence, stayed put. Longer term rates all dropped. That curve from 2018 shows a “normal” pattern for yield curves — in general, interest rates for longer-term debt are higher than shorter term. Now, the curve isn’t fully inverted (that’s NASTY) — it’s still got positive slope for the very longest term issues. The business news is all over this, because this doesn’t happen all that often, and it affects the financial industry a great deal. The inversions continue to happen in the yield curve. This Wall Street-speak means that short-term fixed-income investments like bonds are paying more interest than comparable longer-term investments, something that hasn’t happened since 2007. The latest example is the 3-month Treasury bill (yielding 2.45 percent) slightly inverting with the 10-year Treasury (approximately 2.44 percent). Though, according to Bloomberg data they were also even for part of the morning as well. When the yield curve inverts – meaning a shorter-term Treasury bill has a higher yield than a long-term Treasury – it’s predicted every recession back to the late 1960s, McBride says. Keep in mind that investors usually demand a higher rate of interest for locking up their money longer. The first Treasury that people buy when risk increases is the 10-year Treasury, says Campbell Harvey, a professor of finance at Duke University. Harvey says he wrote his 1986 doctoral dissertation at the University of Chicago about the yield curve, focusing on the comparison between the spread between the five-year note and the 90-day Treasury bill. The latter length is key, because it equals the time in a quarter. “So, there’s always a lead time. The lead time is empirically anywhere from three quarters to six quarters,” Harvey says. When the 90-day Treasury bill and the 5-year Treasury inverted, the clock started. If it continues for a full quarter, Harvey says that would forecast a recession beginning in 2020. But Harvey says that the yield curve inversion isn’t the only item on his watch list. According to U.S. Department of the Treasury data, there was a five basis point spread between the 3-month Treasury bill and the 10-year Treasury yesterday. The issue isn’t a momentary inversion, which does happen from time to time. It’s persistent inversion. Let’s try a few more stories. 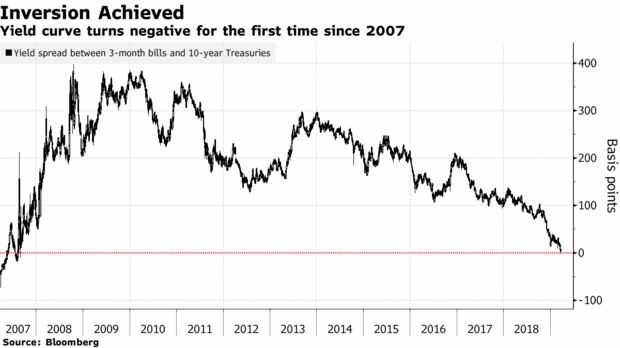 A closely watched measure of the Treasury yield curve inverted Friday for the first time since 2007, highlighting fears that a global slowdown will take a toll on the U.S. economy. The yield on the 10-year Treasury note TMUBMUSD10Y, -3.13% fell nearly 11 basis points to 2.428%, pushing it below the yield on the three-month T-bill at 2.453%. An inversion of that portion of the yield curve is seen as a reliable warning of a potential recession within a year or two. Inversions have preceded every U.S. recession going back to 1955 with only one false positive, researchers at the San Francisco Federal Reserve found. While inversions of other portions of the curve have also served as recession indicators, the researchers said the 3-month/10-year measure is the most reliable. Global bond-markets rallied on Friday, sending yields lower, as a raft of weaker-than-expected eurozone data drew investors into the perceived safety of government paper. Yields fall as bond prices rise. So. What does this have to do with public pensions, as I note in my headline? It does in a fundamental way, and it doesn’t in a surface way. So, public pensions are not required to value their liabilities in the way that annuities are valued, or even private pensions. From a financial economics standpoint, the common theory used to value all sorts of financial instruments, such as stock options and interest rate swaps, if you are making a risk-free promise, then you should use a risk-free interest rate to value that promise. That would be closely tied to Treasury rates, in the U.S. This sort of valuation recognizes there is a yield curve, and so, in general, cash flows that are 10 years in the future would be discounted at a 10-year rate, and cash flows only one year in the future would be discounted at a 1-year rate. Of course, that’s not what public pensions do. It’s a bit more complicated than what I’m about to say, but they essentially base the discount rate on their expected rate of return on risky assets. That has been about 7 – 8% for most plans. I have written about this particular subject many times as this is what set me off against public pension actuaries about a decade ago, when I was working on income annuities at TIAA. Let’s Get Ready for an Actuarial Rumble! I will come back to that last link in a bit, because I want to talk about what Calpers is doing. That last item is from naked capitalism, and the next one is also from naked capitalism. “So the very first question is why private — why — why do we need private equity? And the answer is very simple. So if I could give you a one-line exact summary of this entire presentation would be we need private equity, we need more of it, and we need it now. So let’s talk about the first question, why do we need private equity? And the answer is very simple, to increase our chance of achieving the seven percent rate of return, and to stabilize employer contribution, and to help us to secure the health and retirement benefit of our members. The problem for Calpers is this: it has a sub-70% funded ratio, and it doesn’t look like the ratio will be going up any time soon. It sees an increasing contribution rate… that it knows its members will not be able to keep escalating. If you go to Ben Carlson’s original piece, the point is that private equity is a lot riskier than other asset classes. Those bars you see are variation in results. And the problem is the timing — Calpers has cash flows in and out. Private equity, by its very nature, is illiquid, meaning you can’t easily cash out. Will those assets be able to provide needed cash flows when the time comes? 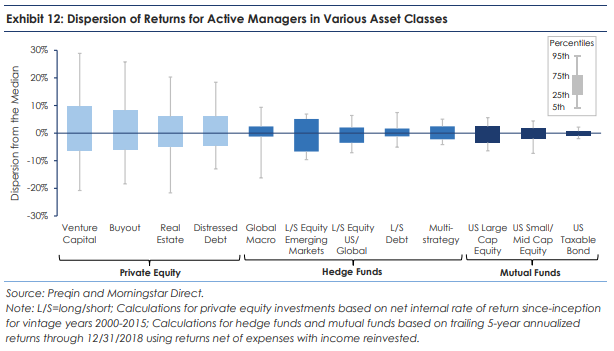 In the paper I wrote with Gordon Hamlin, I investigated increasing allocations to “alternative asset classes”, of which private equity is one flavor. What these alternative asset classes have in common is that they’re difficult to value and are illiquid. Allocations to these alternatives have been growing among public pension funds. But you don’t have to take my word for it. You can check out this paper from Cliffwater. Look for ‘	An Examination of State Pension Performance 2000-2018’ for download. Look at that blob of red dots. That’s the private equity. They’ve got relatively high return (vertical axis), and semi-high volatility (horizontal axis) … doesn’t look too bad, right? Take a look at 18 years. See that blob of red dots all the way to the right? That’s private equity. Highest in riskiness… and the returns? Well, ponder that one for the weekend.